San Francisco, CA - April 3rd , 2014 NAB Show - Fiilex, a leader in LED lighting for the broadcast, film and photo industries, announces the release of their latest light, the P360EX. Building on the success of their P360, a lightweight color tunable (3000-5600K) light, the P360EX offers enhanced protection from water. 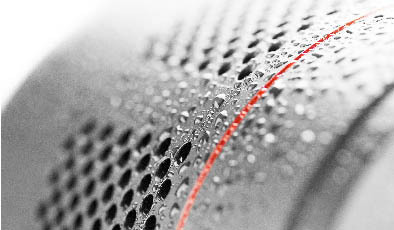 It has an IP-24 rating, allowing it to be used in rain and humid settings without a problem. The light also offers DMX controllability with the optional DMX Connection Box. The light is also 20% brighter than the previous model, and still maintains a high CRI >92. "We built this light for image-makers who need more control, working in environments that may be hard to control. We wanted to give the P360 the great water and weather protection of our P180E light. The P180E has been a great success in the ENG (Electronic News Gathering) world, and we wanted to create more solutions for location lighting," says Brent Siebenaler Brand Manager for Fiilex, " With the new DMX Connection Box option, you can now control multiple lights from a central source, allowing you to work even quicker than before. With its light weight, more powerful output, and small form factor, the P360EX will change the way you light." The P360EX utilizes Dense Matrix LED™, this patented technology allows for placement of many LED chips in a tightly arranged pattern. The result is a super - bright point - like illumination source with high CRI (Color Rendering Index) and adjustable color temperature. This proprietary technology is unique to Fiilex. The added features of the P360EX are: a 400W equivalent output (90w Draw), can run on AC/DC power (12-28v DC), a cool to the touch housing, and a magnetic accessory mount. Available accessories include a Dome Diffuser, Fresnel Lens, Gel Holder, Umbrella Holder, Rain Shield and more. The DMX Connection Box features 512 addresses, XLR5 in/out, RJ45 in/out, and an LCD Display. With one box you can daisy chain all of your lights together and control them from one panel, or use multiple boxes for individual control. The DMX Connection Box also comes with a mount for attaching to a light stand or tripod. The P360EX is available now for order from dealers throughout the U.S., Canada, and Europe, and will ship mid May. The U.S. retail price is $895.00. The optional DMX Connection Box is $150.00. For a complete list of dealers and accessories please go to www.fiilex.com.